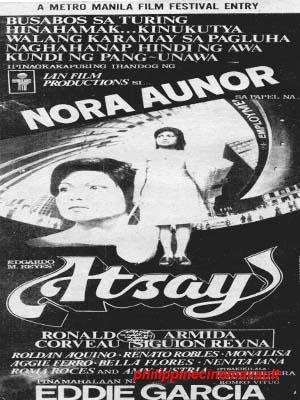 Do you remember when Nora Aunor won the 1978 Metro Manila Film Festival Best Performer Award for her movie "Atsay"? ; and in accepting the award she burst into tears and said, "Mamay, mali ang hula nila!". Her very close rival for that award is Vilma Santos for "Rubia Servios", megged by ace director Lino Brocka. 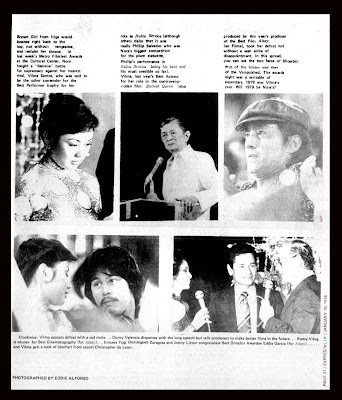 At that time, before the awards night, movie press predicted in a television talk show of Inday Badiday "Would You Believe?" that Nora Aunor's movie "Atsay" will be her last card if she did not make it to win the Best Performer Award and that Vilma Santos will get the trophy. 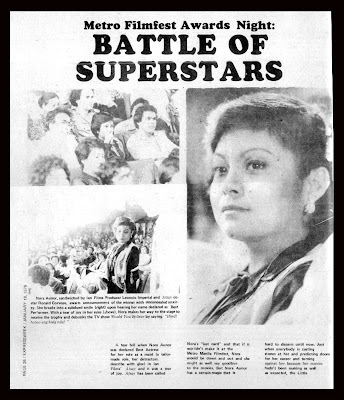 But Nora Aunor won, and the rest is history. ano ka ba ? of all films - yung walang kwentang Darna . sya pa naman pinika chubby at maliit na darna of all time.